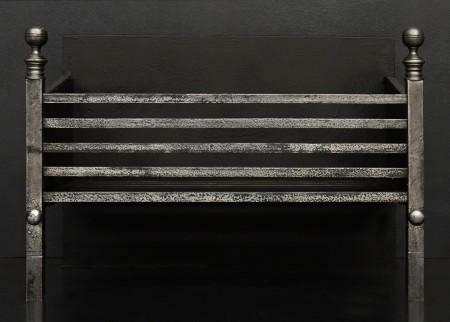 A Georgian style steel register grate. Fluted fret, urn finials and plain circular patera to centre. The size of 38″ x 38″ (965mm x 965mm) has a little tolerance if needed. Please do call to discuss if your opening size is slightly different from this. N.B. May be subject to an extended lead time, please enquire for more information. 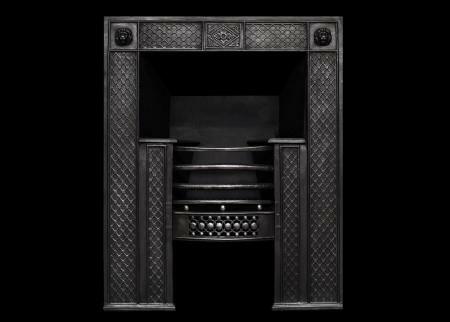 A fine quality decorative cast iron register grate. 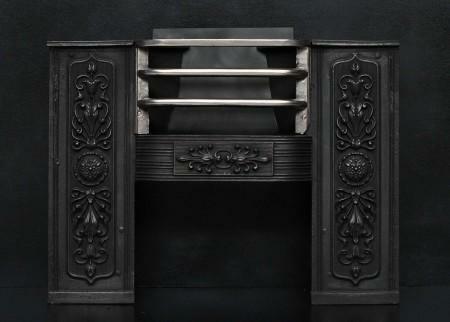 The outer frame with adorned with paterae, panelling and beading throughout. 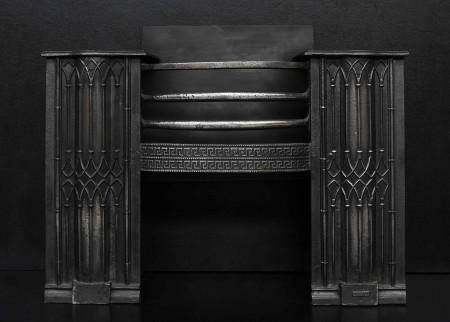 The burning area with urn finials, shaped front bars and pierced, fluted fret. English, early 19th century, possibly earlier. 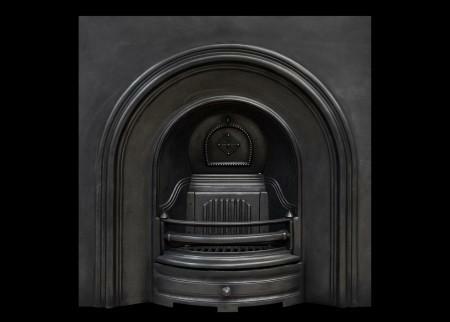 A cast iron insert in the Victorian style. 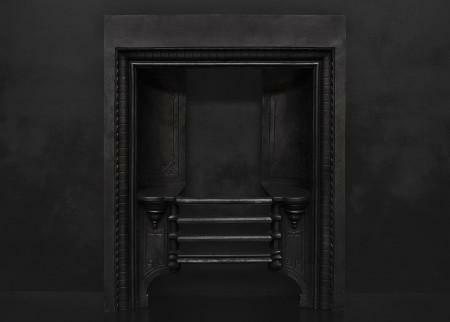 The arched insert with bowed burning area, and decorative cast iron panel behind. Modern. 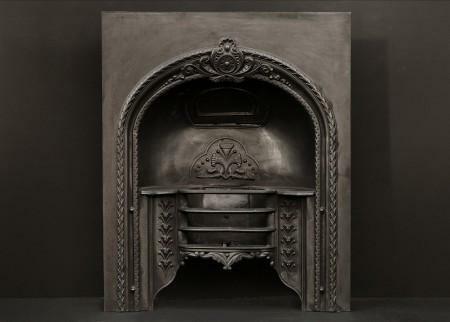 A Victorian cast iron insert. The outer moulding with lotus leaf moulding, the burning area with shaped front bars and shaped returning panels to interior. One of a pair with RG105. 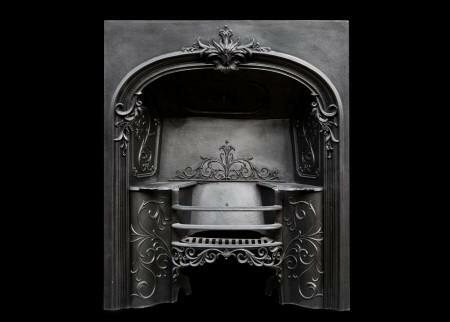 A Victorian cast iron insert. The outer moulding with lotus leaf moulding, the burning area with shaped front bars and shaped returning panels to interior. One of a pair with RG106. 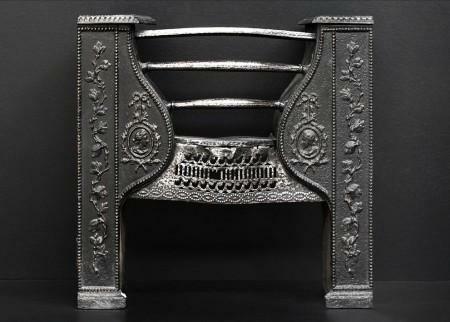 A decorative late Georgian cast iron insert. The frame with crosshatching throughout with lion masks to top. The burning area with shaped cast iron bars with guilloche fret below. English, late 18th century. Could be fully polished if required. 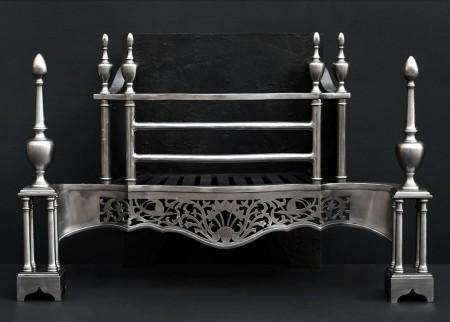 An elegant cast iron hob grate. The decorative front with foliage and scrollwork throughout. 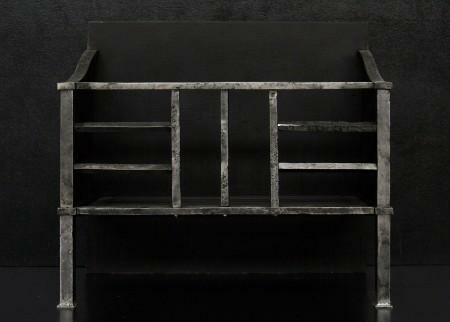 The burning area with shaped front bars with pierced fret below. English, 19th century. 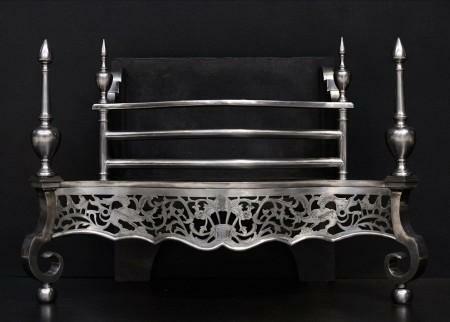 An attractive cast iron ‘hour glass’ hob grate with rosette paterae embellishments. English, 19th century. 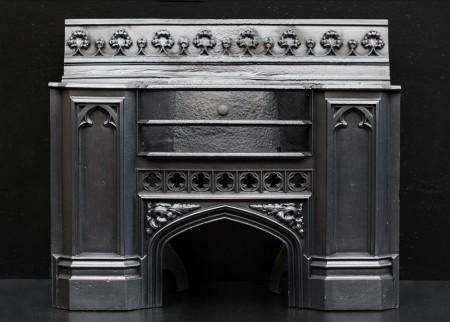 A good quality English hob grate in the Gothic taste. The shaped front area with Greek key fret below. Half polish finish. A late Georgian style cast iron register grate. 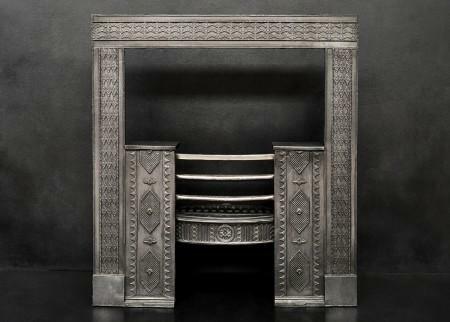 The cast frame with oak leaf detailing throughout and roundels to corners. 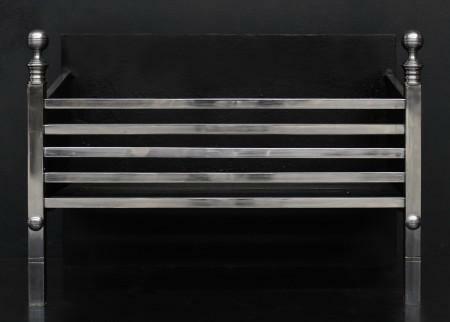 The burning area with reeded fret and hobs. English, 19th century. Could be polished to a high shine if required. 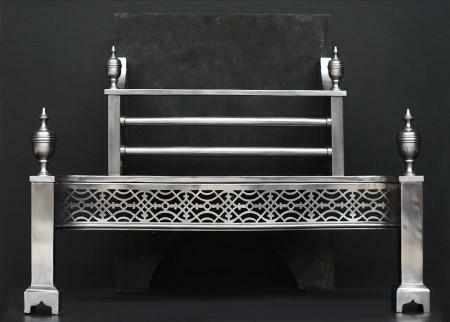 A 19th century cast iron hob grate, the reeded panels with anthemion and rosette detailing, shaped fret and polished steel front bars. 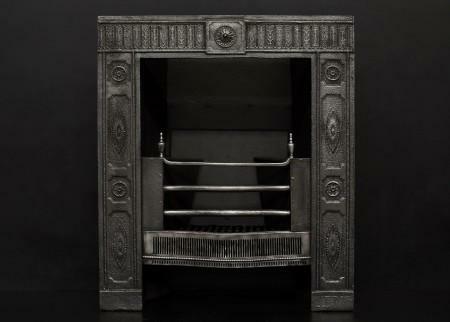 A late Georgian style cast iron register grate. 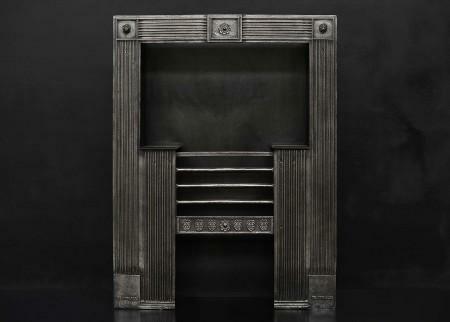 The reeded frame with finely cast lions masks to corners, and framed rosette to centre. The burning area with straight front bars with delicate fret featuring Anthemian leafwork. English. Semi polished. 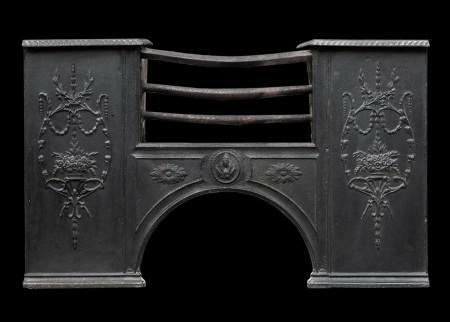 A petite 18th century cast iron hob grate. The front panels with rising flowers, vines and busts, the central burning area with pierced fret and interlocking beading, surmounted by shaped front bars. English, period. 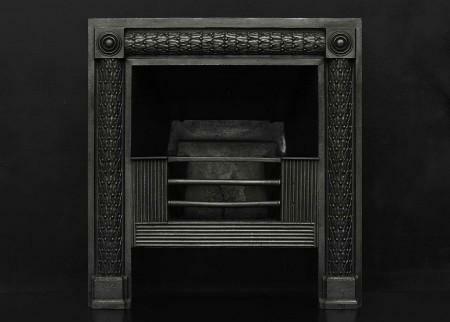 A small scrolled firegrate in the Arts and Crafts manner. 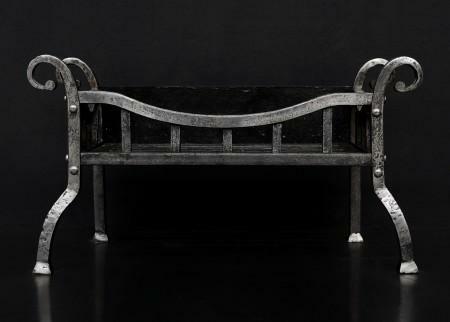 The shaped legs surmounted by square uprights and bowed top bar. Scrolled finials to front and rear. 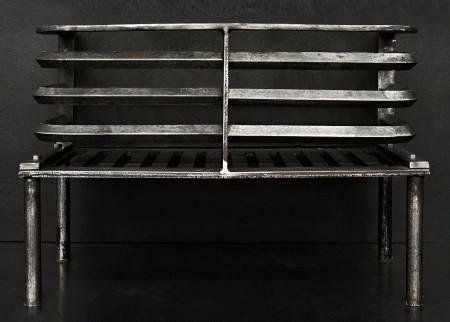 Antiqued finish. Modern. 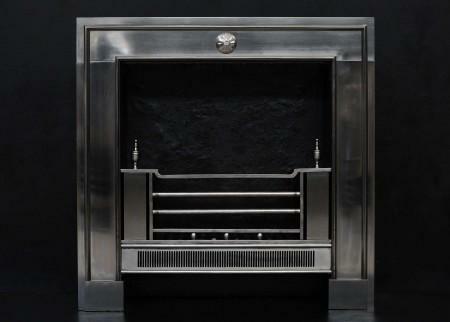 An English polished steel firegrate. 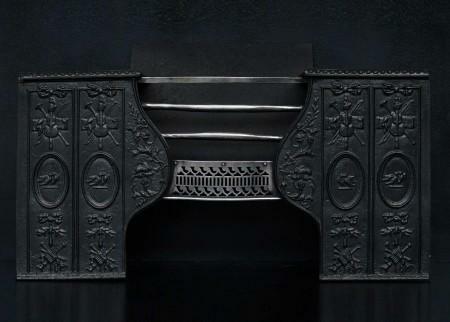 The shaped feet surmounted by ball finial, the burning area with elegant front bars and shepherd’s crook finials on each side. 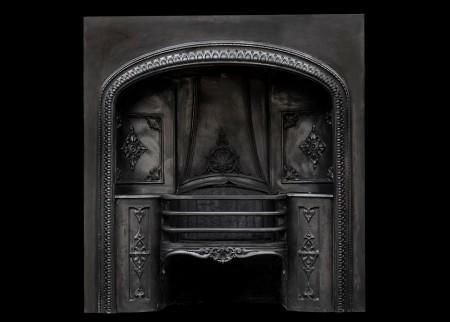 Square cast iron fireback. A copy of an original piece. N.B. May be subject to an extended lead time, please enquire for more information. A Georgian style steel firegrate. 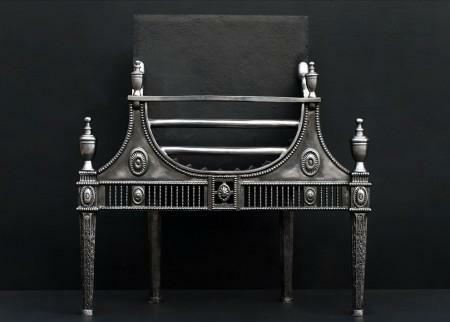 The square legs surmounted by acorn shaped finials, pierced fret and shaped steel front bars. 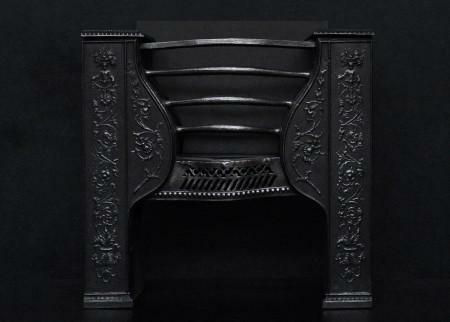 Square cast iron back. 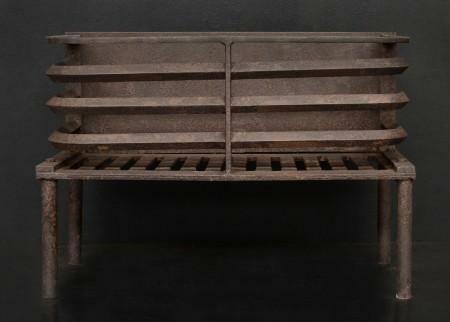 A good quality Georgian style English steel firegrate. The pierced, engraved fret with basket of flowers to centre, flanked by foliage and dragons. The scrolled legs surmounted by large finial. 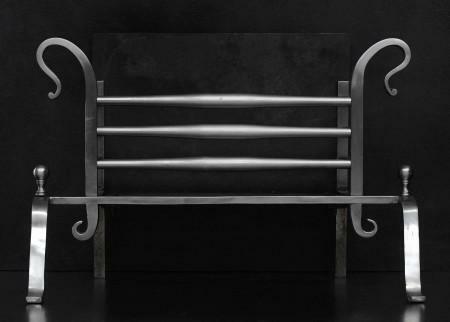 Shaped front bars with substantial burning area. Plain cast iron back. A quality copy of an earlier piece. N.B. May be subject to an extended lead time, please enquire for more information. 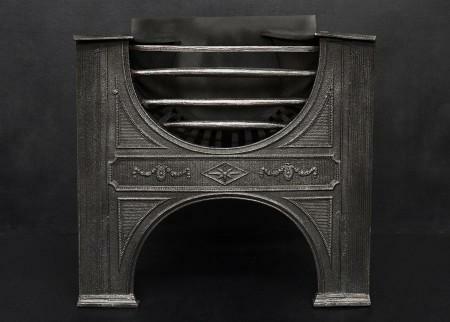 A mid Georgian Chippendale style steel firegrate. The shaped, pierced and engraved fret with centre basket of foliage and winged heraldic birds, with columns and finials above and bowed connecting front bars. The legs with four narrow tapered columns surmounted by urn shaped finials. Plain cast iron back. N.B. May be subject to an extended lead time, please enquire for more information. 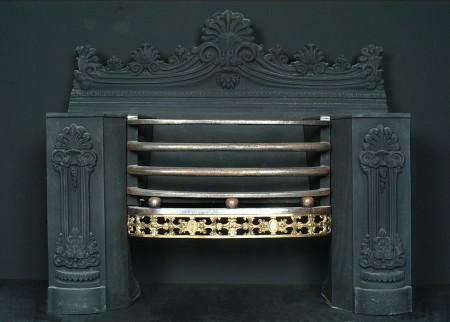 A decorative polished cast iron firegrate in the Regency style. 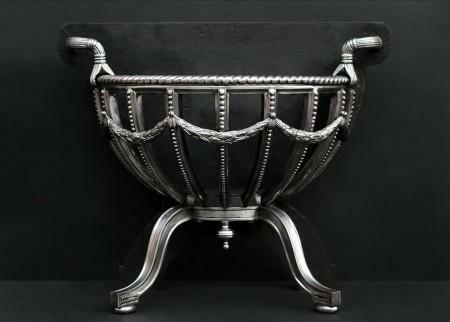 The oval feet surmounted by shaped legs with Greek key pattern to feet, the semi circular burning area with beaded front bars and swags and rope moulding above. 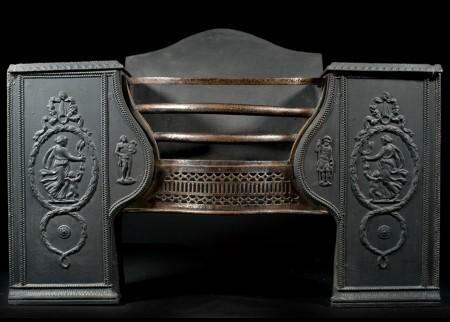 Reeded shaped ties to cast iron back. N.B. May be subject to an extended lead time, please enquire for more information. 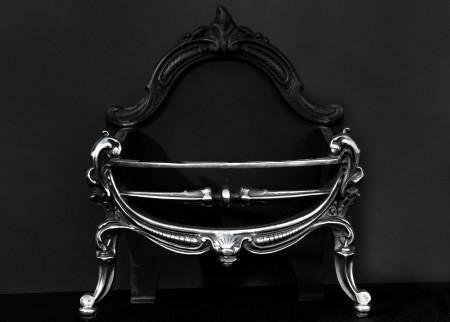 An English mid Georgian style polished cast iron firebasket. The shaped front and fret with paterae decoration and urn finials. hexagonal legs with husk drop decoration. Plain cast iron back. A copy of an earlier piece. N.B. May be subject to an extended lead time, please enquire for more information.